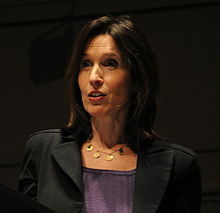 Katrina vanden Heuvel is one of the primary voices of American political liberalism. She is the editor, part owner and publisher of the liberal magazine “The Nation”. Vanden Heuvel has been the editor of the “The Nation” since 1995, and her own articles and her own liberal political outlook articles appear regularly in “The Nation”. Vanden Heuvel previously, since 1989, had the “The Nation’s” editor-at-large position, responsible for its coverage of the USSR. In 1990, vanden Heuvel co-founded “Vyi I Myi” [You and We], a quarterly feminist journal linking American and Russian women and became its co-editor. Vanden Heuvel is also a frequent commentator on American and international politics on MSNBC, CNN and CBS. Her own articles have appeared in the “New York Times”, “The Washington Post”, “The Boston Globe”, and “The Los Angeles Times”. Vanden Heuvel has edited or co-edited several books. She co-edited [with Robert L. Borosage], “Taking Back America--And Taking down the Radical Right”, published by NationBooks in 2004, and edited “Dictionary of Republicanisms”, published by NationBooks in 2005. Vanden Heuvel co-edited [with Stephen F. Cohen], “Voices of Glasnost: Interviews with Gorbachev’s Reformers”, published by Norton in 1989, and edited “A Just Response: The Nation on Terrorism, Democracy, and September 11, 2001”, published by NationBooks in 2001. Vanden Heuvel has received considerable recognition for her reporting and commentaries. In 2003, she received the Callaway Prize for the Defense of the Right to Privacy from the New York Civil Liberties Union. In 2003, she also won the Voices of Peace Award from the American-Arab Anti-discrimination Committee. Vanden Heuvel has also received awards for public service from several groups including the Liberty Hill Foundation, the Correctional Association and the Association for American-Russian Women. Vanden Heuvel is also a recipient of the Planned Parenthood’s Maggie Award for her article, “Right to Lifers Hit Russia”. The special issue of “The Nation”, conceived and edited by vanden Heuvel, and entitled, “Gorbachev’s Soviet Union” was awarded New York University’s 1988 Olive Branch Award.